observation history, or an association of the record with previous records of the same plant at the same location. 2. Choose a Group (AKA "Organization"). The choice of group determines which projects are available. If you choose the Independent group, two projects are available: Simple data collection and Advanced data collection. If you are part of a Weed Manager group, other projects will be available. 3. Choose a Project. Choice of project determines which dynamic form appears in Section 3. The ADVANCED DATA COLLECTION form is the default, and is adequate for many purposes. 4. Press Point Location to open the popup. -- your next click on the map will become the point location of this record, indicated by . For a step-by-step explanation of the process, see Map Applications / Adding a Point Location or watch this YouTube video. 5. Choose a plant by typing a few characters into either Scientific Name or Common Name, and selecting a plant from the drop down. The values of Observer and Observation Date will already be filled in. If necessary, change these values, and fill in any other values of fields in the dynamic form, Section 3. 6. To add a shape, press Shape to open the popup. Then press start drawing, and click on the map to set the vertices. Press stop drawing when you are finished. Press Shape to close the popup. 7. To add a photo, press Add a photo (Section 4, lower left) to open the popup. 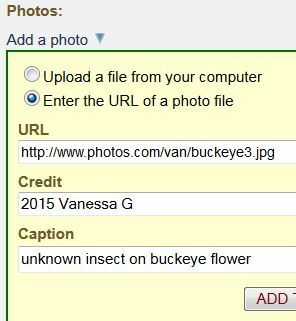 If the photo is already on the web, you can add the photo file name (URL) to your observation record. Note that the URL of a photo file ends in .jpg, .jpeg or .png. With a broswer such as Firefox, you can usually get the URL of a photo file by right clicking on the photo, selecting Copy image location, and then pasting into the URL field. When you press ADD THIS PHOTO, you should be able to see the photo immediately. If you do not see it, something is wrong. Alternatively, check Upload a file from your computer, then press the Browse button. When you have selected a file from your computer, press UPLOAD. When the file has been successfully uploaded to Calflora, the popup will close. You can add many photos to a record. You can also rotate a photo or change the Credit and Caption of a photo at any time -- click on the photo to edit these values. 8. Fill in values for any of the other fields in Section 4. If you drew a polygon, press calculate next to Gross Area. 9. Press SAVE. Required values are indicated by *. If any required field values are missing, the application will let you know. 2. Choose a Group, for instance, Independent. 3. Choose a Project, for instance, Simple Data Collection. 4. Press Add a photo to open the popup. Check Upload a file from your computer, then press the Browse button. When you have selected a file from your computer, press UPLOAD. When the file has been successfully uploaded to Calflora, the popup will close. If the photo was geotagged, a point location for your record will appear on the map at the coordinates from the photo's exif. The observation date will be filled in with the date of the photo. 5. Enter the name of the plant (or if you are not sure, enter "unknown"). Fill in values for any of the other fields. Start viewing the previous record (for example mx123) in this application. Look for the record either by clicking on the colored markers on the map, or by scrolling through the table. When you find the record, click on the ID (for example, mx123). In the menu that appears, click edit, which will bring up this application viewing the record.
. Choose New assessment of mx123 from the menu. Management Status is set to verified. The other fields are left empty. You can change any field values if you need to. When you save this new record, it will become part of the observation history of the original record. So for instance, if the original record is mx123, and mx123 is the earliest record of this plant at this location, then the new record will be associated with mx123 in a history stack. A history stack is the list of all records concerning a single plant population, in observation date order. Going forward, if you view either record in POE, both records will appear in the observation history stack, and you can easily jump back and forth between them. This is handy if, for instance, both records have a polygon, and you want to see how the population is changing over time. NOTE: If the existing record has a polygon, you can use exactly the same polygon in the new assessment, or start with a copy of the existing polygon and modify it for the new assessment, or start from scratch and draw a new polygon. if you want to start out with a copy of the existing polygon, and modify it for the new assessment. The right side of the page is devoted to a map. The left hand side is scrollable, and organized into four sections. Header: The record header shows what the application is doing at the moment (viewing an existing record, editing an existing record, or adding a new record). Group The group (organization) responsible for this record. If you are a member of any Calflora groups, they will appear here in a drop down during editing. The default group is Independent. Each project is associated with a dynamic form, which appears in Section 3 (below). If you are a member of a Weed Manager group, your group will have its own projects defined. All of a group's projects appear here in a drop down during editing. published The public (any Calflora user) can see this record. unpublished Only the owner (or members of the group, if this record belongs to an group) can see the record. private Same access as unpublished. Set the value to private if you intend to keep the record out of the public eye for an extended period of time. History An observation record describes a population of a certain plant at a certain location. Some plant populations have been tracked over time by multiple assessments -- for instance, documenting how the size of the population has increased or decreased. When viewing an observation record, open History to view any precedent or subsequent records of the same population described by the current record. Once Scientific Name has a value, you can search for nearby observations of that plant, also in the History panel. At the bottom of Section 1 are control buttons. If you are viewing your own record, press the EDIT button in order to make changes. If you are a contributor, press the NEW RECORD button to add a new record. If a shape (polygon or line) is defined for this record, a red oval appears. If a point is defined for this record, a blue point appears. Note that on the map, the blue point indicating the location of the record is independent of the map cursor, . You can move the map cursor without changing the location of the record. Generating a Polygon. If the form you are using has a Radius field (also called Buffer), then it is possible to generate a polygon from either a point location or a line. 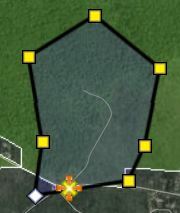 After generating a polygon, the Gross Area will be automatically calculated. To generate a polygon, start editing the record and open Shape . Note that the polygon generating software in POE will not introduce holes (islands), even if the line twists back on itself. If you have a situation that requires holes, use the Shape Editor to generate the polygon. The dynamic forms that appear in this section correspond to the dynamic forms available in the Observer Pro phone application. For instance, suppose you make an observation with Observer Pro with the Independent group and the Advanced data collection project, which uses the ADVANCED DATA COLLECTION form. When you view that record with this application, the same form will appear here in Section 3. Scientific Name The scientific name of the plant observed. During editing, typeahead is enabled -- type the first three letters, then choose the name from the popup list. Common Name The common name of the plant observed. During editing, typeahead is enabled -- type at least three letters, then choose the name from the popup list. Observer The person(s) who observed the plant. When adding a new record, this field is filled in with your name. Observation Date Date the plant was observed, in the form YYYY-MM-DD. For example, 2016-12-31. Phenology In which stage of life is this population? Is it blooming? Number of Plants * An estimated range of the number of plants at this location. 1+ is a special value meaning at least one plant. 0 is a special value meaning no plants, or absence. Photos Any photos of this particular population. During editing, you can attach a photo to a record by uploading it from your computer. Or, if your photo is already on the web, you can paste in the URL. If you are making a new record, and you upload a geotagged photo before setting a point location, POE will grab the coordinates and the date from the photo. Photos uploaded to Calflora are shrunk to 1200 x 900, and stored without exif information. Management Status The earliest record of a population has no value for management status. (No value for management status is also referred to as reported, meaning that the plant has been been reported once at the location, but not yet verified.) A subsequent assessment of that same population will be automatically assigned a management status of verified. 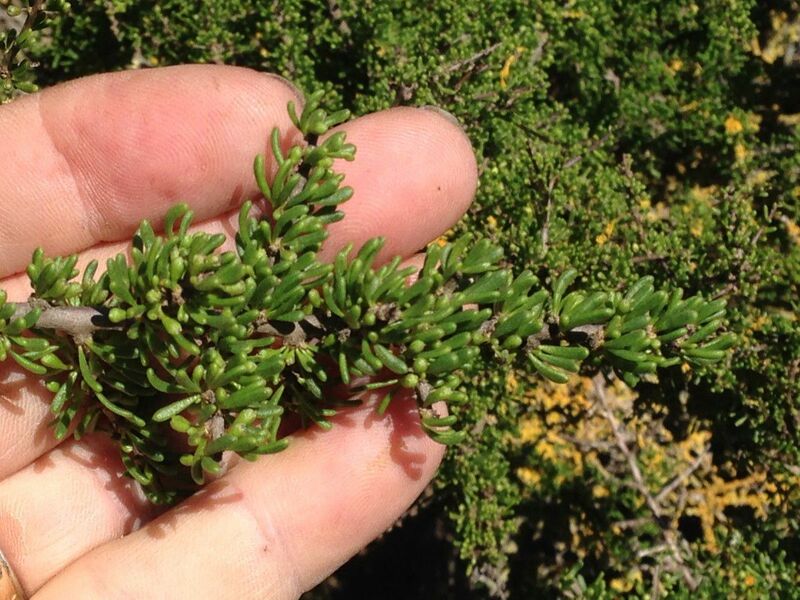 Suppose you are looking for a particular plant population at a precise location that was recorded in a previous year. If you do not find it, you could enter a record for that plant at that location and specify the management status as searched for but not found. If the population is being treated, specify the management status as managed. If you check later and find that the treatment was successful, you can enter a new assessment and specify the management status as extirpated. If you are doing a survey, and did not find a particular plant in the survey area, you could enter a record for that plant in that area and specify the management status as searched for but not found. Natural Status Was the observed plant growing wild, or was it planted by a human? Note that only records with Natural Status = wild are included in search results from applications such as Observation Hotline. Collection Use this field to divide your records up into various collections. Or, include search terms in the value of this field that will make it possible to categorize records later. Region For some Weed Manager groups collecting data with the Observer Pro phone app, the value of region will be automatically assigned to the name of one of a set of pre-defined regions. If you are using POE as an Independent, you can ignore this field, or use it to describe the general area where you observed the plant. Ownership (AKA National Ownership) A broad classification of who owns the land where the plant is growing. Elevation The elevation at the point location of this population. 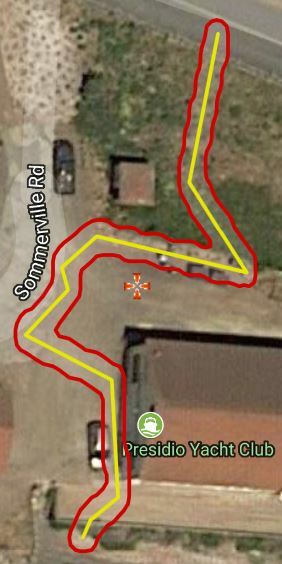 During editing, once a point location has been chosen, press lookup elevation to find the elevation. Location Accuracy An estimate of the accuracy of the location coordinates, expressed as an area in square meters. For instance, if the location accuracy is set to 100 square meters, then the idea is that the real point is somewhere within that 100 square meter area. Gross Area The size of the area where the population was observered. If you have drawn a polygon, press calculate area to calculate the area of the polygon. If you have specified a Radius as a buffer around the point, press calculate area to calculate the area of the implied circle. More critically, Gross Area is the area of ground covered by the patch of plants, if you drew an imaginary line around the outer boundary of the patch. Herbarium If a specimen of the plant was taken and sent to an herbarium, the name of the herbarium. Source Organization If an organization was involved in the data collection effort that resulted in this record, the name of the organization goes here. Index Date Set to the moment when the record is added to the database. Observer Set to the name of the person who is logged into Observer Pro, if it does not already have a value. Typically, the value of Observer will be the name of whoever is using Observer Pro. On some dynamic forms, this field is exposed, and the user can enter a different value. Observation Type Set to undirectedsearch if it does not already have a value. Documentation Type Set to reported. Natural Status Set to wild if it does not already have a value. County Set to the name of the appropriate county if the point location of the record falls within the boundary of a California county. Group This will be the Group chosen by the user when entering the record in Observer Pro. If the user has selected a default group for new observations in My Calflora / Preferences, then, when the user enters an observation as Independent in Observer Pro, Group will be set to the selected default group. Management Status If Number of Plants is 0, Management Status is set to searched for but not found. Otherwise, if there is a value for Treatment Method, Management Status is set to managed. Otherwise, if the record is a new assessment of an existing record, Management Status is set to verified. Region Some Weed Manager groups have a set of regions defined (polygons of management areas). If the record belongs to one of these groups, and the point location of the record falls within one of the defined regions, Region is set to the name of the region. Location Accuracy (square meters) If the record coming in from Observer Pro has a value for Error Radius (in meters), then Location Accuracy is set to the area of the implied circle. Inside Observer Pro, Error Radius is obtained from the GPS system at the moment an observation is made. Gross Area If Radius (in meters; a buffer around the point) is present in the dynamic form and has a value, then Gross Area is set to the area of the implied circle. Data collection forms have been designed for use in both the Observer Pro (OP) phone applications and POE. The appearance and behavior of most forms (for instance, ADVANCED DATA COLLECTION) is similar on the phone and in POE. Weed Manager groups have requested their own special purpose data collection forms, which may include fields that concern treatment, and/or the number of hours spent doing the treatment. Here are some things to watch out for in these more complex forms. Some groups have arranged that when a record is uploaded to the server, the point location is automatically resolved to a management unit or region. In this situation, there is a Region field on the form, but it only appears in POE, and not in OP. The idea is that a staff member does not need to see or choose Region when they are in the field, since it can be determined with greater accuracy automatically later. On the other hand, having Region appear on the form in POE is a convenient reminder for anyone looking at the record. Some groups have asked for several Crew fields on their form (specifying who did the work), and a number of Hours for each crew. When these records are uploaded to the server, Work Session records are generated from the crews and hours specified. The Work Session records are used in all subsequent reporting. In this situation, the Crew and Hours fields only appear in OP, and not in POE. That is, these fields appear in OP as a convenience for getting crews and hours into the Work Session table; they are not really part of the observation record. If you are editing one of these observation records in POE, and you need to change Crew or Hours, open HOURS , and make your changes directly on the Work Session records associated with the observation. Some forms include a Radius field; usually in meters, but sometimes in feet. When a record arrives at the server with a point location, a value for Radius, and no polygon or line, then the server will calculate the value of Gross Area as π R2. If you draw a polygon in OP, OP will calculate Gross Area, and you will see this value when you first look at the record in POE. 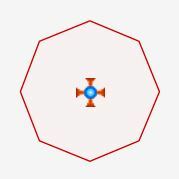 You can re-calculate the area of the polygon in either POE (see above) or in Group Observations -- Weed Manager uses the Google Maps API, so the polygon must be displayed on a Google Map for this calculation. Once an observation record has a polygon, the value of Radius is ignored. Note that if you edit a polygon in POE, Gross Area will be automatically re-calculated when you finish editing. Some forms include both a Radius field and a Generate a polygon checkbox. If this box is checked, and Radius has a value, then when the record arrives at the server, a regular polygon will be generated based on the value of Radius. Note that the record does not have a polygon when it is first created on OP, and therefore OP does not calculate Gross Area. When you first look at one of these records in POE, the record will have a polygon but will not have a value of Gross Area. 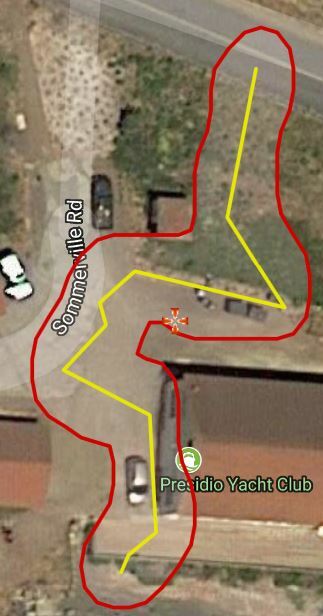 You can calculate the area of the polygon in either POE or in Group Observations -- Weed Manager uses the Google Maps API, so the polygon must be displayed on a Google Map for this calculation. For more information about map background layers, see Layer Help. 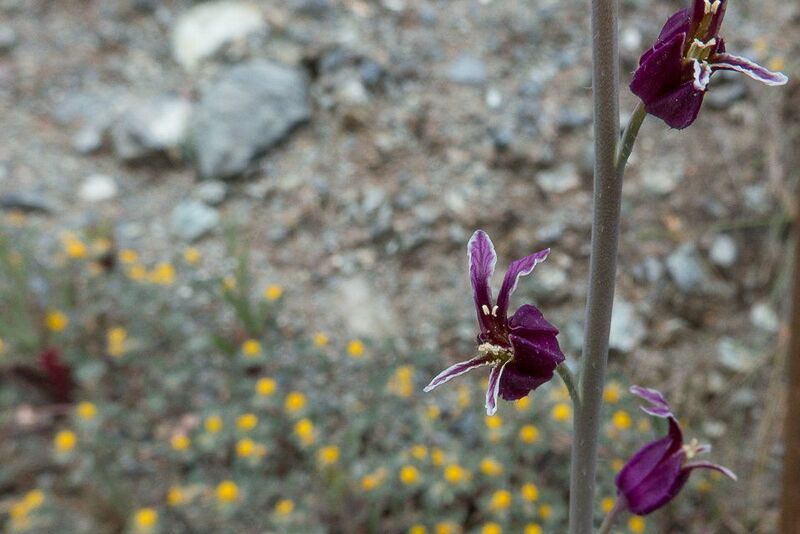 Example: Cindy Roessler's record of Streptanthus glandulosus, Jewelflower, Santa Clara Co.
 December, 2018: v. 4.89: "Organization" changed to "Group". If you press Point Location . to change the point location, it opens a dialog box. In this version, after you have changed the point, you will see a confirming message, and the dialog will stay open in case you want to change it again.  June, 2018: v. 4.61: If you upload a geotagged photo, POE will grab the coordinates and the date from the photo.  January, 2018: v. 4.40: If you are using a form that has a Buffer or Radius field, you can generate a polygon from either a point or a line.  August, 2017: v. 4.22: Introducing the population record, including a reference polygon, described HERE. When a history stack has polygons, a population record is automatically created for it. You can change the reference polygon when you are editing any one of the records in the stack. Press POPULATION (lower left) to open the population editor.  October, 2016: v. 4.01: The link to Work Session Entry in TOOLS has been replaced. To edit the hours associated with a record, click on HOURS , and an embedded version of Work Session Entry just for the current record will appear. It shows any hours of work now associated with the current observation record. If you are the owner of the record, or a data czar for the group, you will be able to add additional work session entries or change the ones that are there.  April, 2016: v. 3.91: When POE is showing a treatment record, the record number at the top of the page is written in DARK RED. This should make it clear that you are looking at a treatment record without having to scroll down to see the treatment fields. Inside of History, the record numbers of any treatment records are also written in DARK RED.  February, 2015: v. 3.44: If you are editing a record with photos, and the photos are stored on Calflora, you can rotate a photo clockwise or counter-clockwise by 90 degrees. Click on the photo to open the edit panel, and then click on the arrow for which way you want to rotate.  December, 2014: v. 3.27: When you are looking at a Weed Manager record, there is a link in TOOLS called Work Session Entry which goes directly to the work session entry app, already dialed into the group, project, and date of the record. If work session records have already been entered for this project on this date, you will see them; otherwise you can enter them. There is a link in TOOLS to Observation Hotline, already dialed into the map cursor location . This is another way to find nearby records.  July, 2014: v. 3.01 (beta) released.